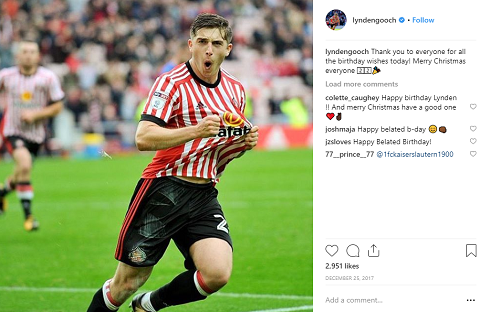 An American soccer player Lynden Gooch currently plays for the Sunderland in EFL League One. Gooch plays the position as a midfielder. He signed U-16 side of Sunderland and further played for the U-18 and U-21 sides. Moreover, Gooch further played for Conference side Gateshead and Doncaster Rovers in a loan. Similarly, he has also played for the national team. Lynden is currently dating his girlfriend Talia McKenna. 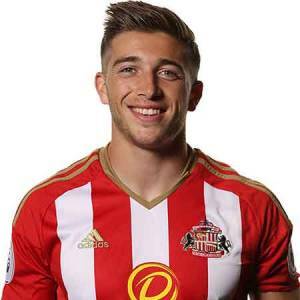 Lynden Gooch was born on 24th December 1995, in Santa Cruz, California, United States. He was born to an English father Paul Gooch and Irish mother Irene Gooch. He belongs to an American nationality. His father is a professional football coach. Gooch began playing football in his early age and further joined the U.S. Soccer Development Academy club Santa Cruz Breakers Academy. However, the information about his educational background is yet to be revealed. Lynden Gooch traveled Sunderland during his school holidays for training. Later he moved to England and signed a two-year scholarship with at the age of 16. Gooch joined Sunderland U-16 side and further played for U-18 and U-21 sides. Likewise, Gooch joined Conference side Gateshead in the 28-day loan on February 27, 2015. He made his debut in a match against Bristol Rovers playing the full game. While playing for Gateshead, Gooch appeared in seven matches and scored 1 goal. Furthermore, he was also loaned to Doncaster Rovers of League One for a month. Gooch signed a three-year contract with Sunderland on April 21, 2016, with a deal to keep him until 2019. He made his Premier League debut on August 13 in a match against Manchester United. Besides his club career, Gooch is also a member of the National team. He has played for Republic of Ireland U18 side as well as for United States U20. Lynden Gooch is currently in a relationship with his long-term girlfriend Talia McKenna. The couple began dating in 2015 and is still going strong in their relationship. Both the pair spend their time together and further shares photos of each other in their respective Instagram accounts. Along with his profession, Gooch is successfully maintaining his love life too. As the pair is dating for long, none of them have yet mentioned any plans of getting engaged or married. So far, there are no any signs of their separation. Besides this, Gooch hasn't dated any other girls in past. Aged 22, a professional soccer player Lynden Gooch stands the perfect height of 1.73 m which is 5 feet 8 inches tall and weighs 72 kg i.e. 160 lbs. 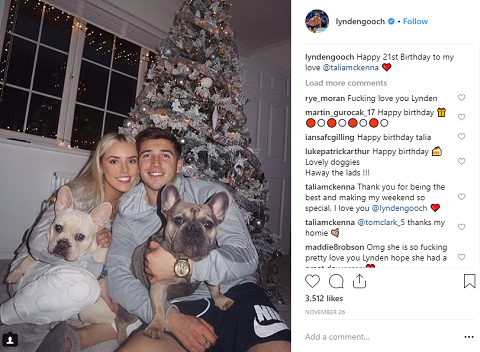 From his professional career as a soccer player, Lynden Gooch earns a tremendous amount of money. However, the current estimated net worth of Gooch is still under review. Furthermore, his actual salary is also yet to be revealed. His current market value is £675k. Gooch currently plays for the Sunderland in EFL League One. Moreover, he also played for Gateshead and Doncaster Rovers in a loan. Similarly, Gooch further adds money from his national soccer team career.